Just like specialists in medical operating theatre, our practice has embraced the use of high-tech microscopes in both clinic studios for magnification to maintain the highest treatment standards. This allows Dr. Knox Kim and our team to see what most dentists cannot see under normal circumstances. 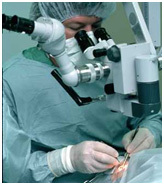 Not only can we see problems when they are very small, we can improve the precision and accuracy of our care for you. Bottom line: your dentistry is more conservative and will last a lot longer. It illustrates our commitment to being attentive to the tiniest detail in our quest to give you lifetime of dental health and a beautiful smile. Dr. Knox Kim is also a member of international Academy of Microscope Enhanced Dentistry for interaction with top clinicians worldwide.